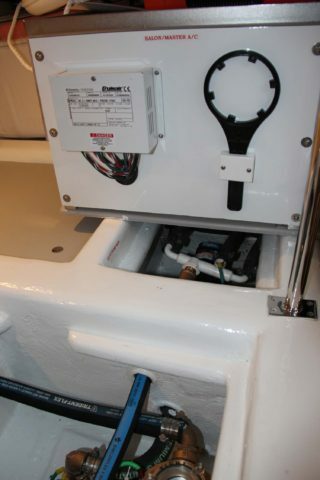 Burr Yacht Sales is now offering the installation of an emergency back-up air conditioning pump as a new retrofit option in your Fleming 55’s lazarette. 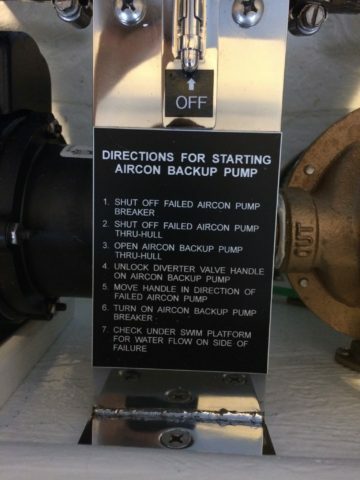 This new option will give you the the ability to maintain function to either the port or starboard compressors in the event of a failed pump, a blocked seacock, or a failed trigger. 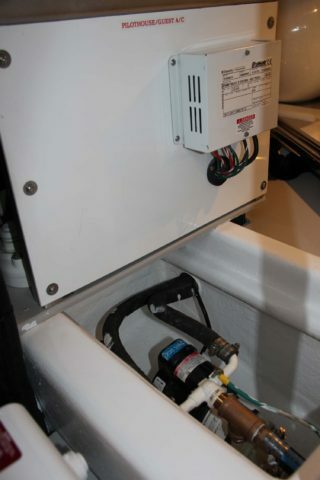 The package includes the back-up pump with a separate internal sea strainer and seacock for the pump and a diversion handle to direct the flow to either the port compressors for the salon/master AC or the starboard compressors for the pilothouse/guest stateroom AC. 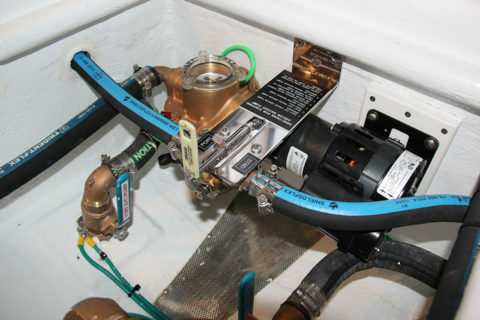 An additional feature that the internal sea strainer provides is the ability to flush your compressor lines with a chlorine tablet in order to keep them clean and clear. With this system being both compact and practical, it allows for piece of mind during humid days while taking up very little space in the lazarette. This option is only available for 55 Flemings and can be applied to all vintages. Call or email us here to order. A close up of the manual diversion handle which features a locking mechanism for when not in use. 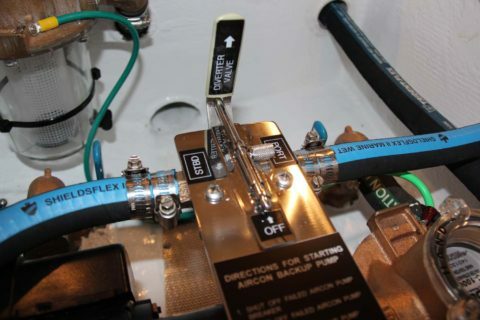 Once unlocked the handle can be turned to either side to direct the pump flow to the desired compressors. A step-by-step operation plate is provided for proper activation. 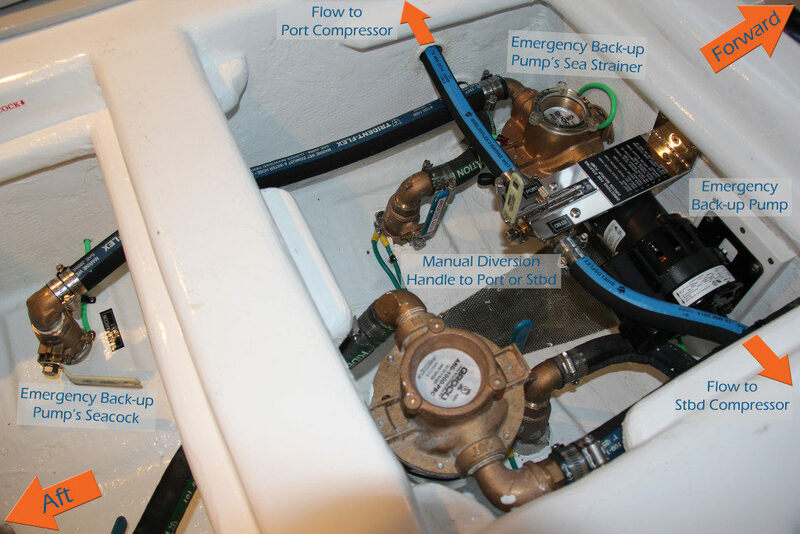 The two pictures to the left show the port & starboard compressors and their respected linkage from the back-up pump. All of these openings are protected with non-skid lifting panels. The picture to the left shows a basic overview of a lazarette. 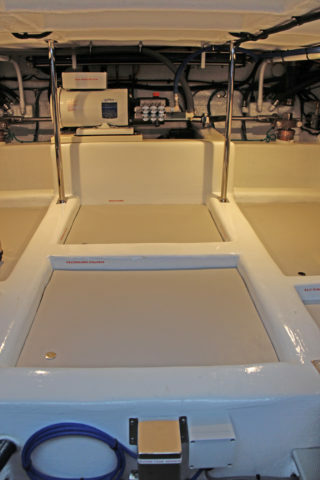 The back-up pump is located mostly underneath the first lifting panel in the center with just the pump’s seacock located under the panel aft of it. The picture to the right shows a close up of the operation plate on the diversion handle.